The House of Representatives had a bill in the works to hand President Obama $659 million to address the situation on the US southern border. The bill did not contain assurances to conservatives that immigration would be curtailed to their liking. Conservatives organized and overloaded the phone lines on the Hill with protest calls. The House caved and the bill is dead for the time being. 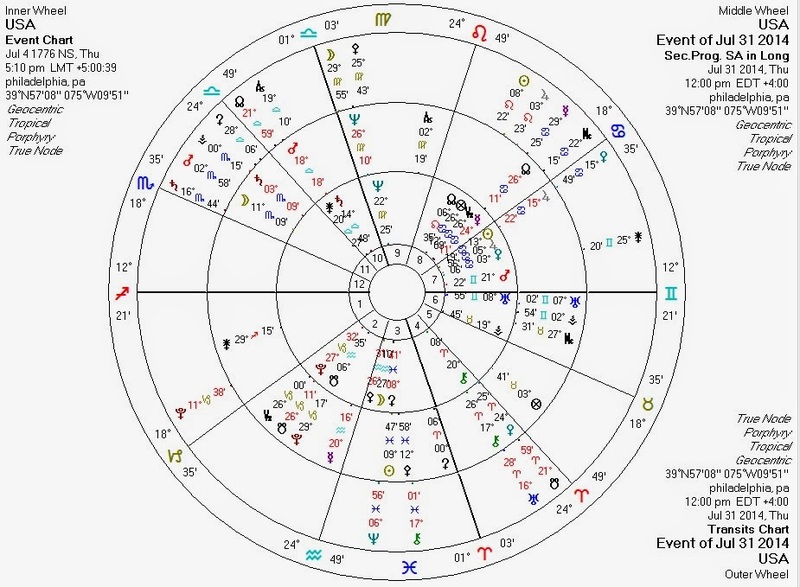 Here's a US Sibley chart with transits and progressions for noon today (the news reports I've read did not report a time for the shelving of the bill). It gives us some interesting data points as well as some mysteries. Transiting Saturn at cusp of USA Twelfth House: blockage (Saturn) regarding foreigners (Twelfth House). Transiting North Node trine USA Mars in the Seventh (ruler of Twelfth): suggests, perhaps, the planting of a seed (North Node) of action (Mars) regarding "others" (Seventh House) and foreigners (Twelfth House). Transiting South Node entering USA Fourth House: a contrary indicator to Saturn in the Twelfth (above), suggesting weakening (South Node) of culture (Fourth House). Transiting Jupiter square progressed USA Saturn (ruler of Second House): perhaps a temporary if uneasy (square) bolstering (Jupiter) of the structures (Saturn) supporting the US economy (Second House). Why USGov allows undocumented/illegal immigrants to collect taxpayer-funded services should be a mystery to anyone who understands arithmetic -- regardless of how they feel about immigration itself. Transiting Pallas quincunx USA Pallas: Pallas is generally going to be strong in some way whenever a government-empowerment initiative fails. Transiting Venus conjunct progressed USA Jupiter in Cancer: a sweet if fleeting gain (Venus) for proponents of race/culture-based ideology (Jupiter in Cancer). Transiting Moon at USA MC: culture/race/nation (Moon) temporarily at "the top of things" (MC). The great libertarian scholar Hans Hermann Hoppe shows us here why open immigration is an inevitable consequence of democracy. Today's conservative victory is, by this reasoning, eventually doomed to fail. The only true hope for the conservative dream of controlling the demographics of where they live may be the anarcho-capitalist solution: privately-owned, voluntary communities. Democracy is, according to Hoppe, a form of Communism in which private property/rights are held to be owned by "the collective". Only in a fully voluntary society can conservatives hope for a stable culture to their liking. Conservatives that reject libertarianism are, like the Left, worshipers of a religion doomed to self-destruct. This is the Age of Pisces: pipe-dreams and self-undoing are not the exception but the rule.